"EAT TO LIVE DON'T LIVE TO EAT"
There are many ways to lose weight. I am personally tired of seeing those ads in magazines and the news paper "lose 60 pounds in 90 days without exercise". We all should know that is a bunch of bull. Here is the truth; losing weight takes dedication and discipline. It takes a lot of work but it is all worth it. The first concept you must understand is your weight loss meal plan that you start off with is just that, a starting weight loss meal plan. Your meal plan will change all through your journey to a better you. So know you will not just be eating lettuce all day. I will give a few fat loss tips that will give you the edge you need. When starting your program do not make huge caloric cuts. Start off slowly reducing calories. If you just cut calories to fast you will send your body into starvation mode and that will slow down your metabolism. Which will make burning fat very difficult. Make caloric reductions every two weeks. If you hit a time where you stop losing weight. What is called "plateau". Use a zig zag caloric method varying your calories. Instead of eating the same calories everyday change the amount of calories you intake every few days. This will put a stop to the metabolic slow down. This will allow your body to burn that fat at a sufficient rate. No matter what Mr. Gym Rat says make sure you train with weights. Training with weights does a number of things for your fat loss. Working out with weights burns calories. In addition unlike aerobic exercise, weight training increases the calories burned at rest for up to 39 hours after your workout. The more muscle your body has the more calories you burn each day. By working out with weights while on a weight loss program will aide you in building and maintaining muscle. A lot of us have problems with lowering our caloric intake. Hunger pains ect. 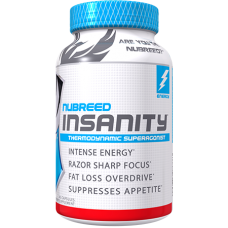 I have found that NUBREED NUTRITION INSANITY 45c provides you the following. I am not going to bull..... you, it does not take your hunger completely away but it helps you out to get you through those rough times. It really works for me when I am cutting weight that and plenty of water. Online Fitness Training and Meal plans available 3 months for $99.99 Muscle-4Life-Nutrition.Com will shape you up. Sign up or for more information Click Online Training on the navagation bar.